It wasn’t a gift from birth that helped him score 62 goals as a youth team player in a single season. It was Acton Park, or more precisely the thousands of hours he spent there with his two brothers practicing and playing football. The park in Acton is just a stone’s throw away from Loftus Road, the home of QPR FC and whenever Kevin Gallen went out to play with his brothers Steve and Joe he could see the top of the stadium’s floodlights glistening in the sun. His motivation was visible at all times! Kevin went on to have a successful career as a Premiership striker, a career largely as a result of the amount he practiced and the manner in which he trained. Recent science is showing us that the way we practice determines how good we become at something. This chapter explores the art and science of training and how to develop the soccer game of your dreams. There is one figure that lays on the lips of many of the world’s finest sports coaches right now – 10,000. It is this number that is believed to be one of the secrets to success. Practice soccer for 10,000 hours and you give yourself a great chance of becoming world class at what you do. But not all soccer fans should get too excited yet. There are, of course, rules and regulations to those 10,000 hours. Some of which I’ll talk about later. It was a Swedish researcher called Anders Ericsson who came up with the magic number. He discovered that experts practice around the same amount of time every single day including at weekends. Back in the 1980s Ericsson travelled to Berlin to study the working patterns of top violinists. At the time, people thought that the really top violinists would train for fewer hours than the less accomplished musicians because they had natural talent and ‘didn’t need to practice’. But Ericsson discovered the complete opposite. The best violinists were the ones who invested significantly more time to practice. As a result, over the past 20 years, Anders Ericsson has argued that people can, by and large, reach excellence in their chosen profession or activity but it takes about 10,000 hours of hard work to do so. And Ericsson discovered more interesting facts. He found that the great violinists tended to take a nap or rest after lunch. The violinists told him that the only way they could keep full concentration was to take regular breaks and limit the amount of hours they practiced per day. They said they felt that without a fully focused mindset they were wasting their time. Anders Ericsson argues that not only do the world’s best become the best because they practice more – but they reach excellence because they practice with greater focus and intensity. Let’s get in our imaginary time machine and head back over 20 years. Kevin’s twelve year old brain is overloaded. The ball is popped between Steve and Joe with ease and Kevin’s task is to win it back from them. He knows he has to read their body shape – he has to pinpoint subtle body movements that tell him whether they will pass or feign and try to go around him. As Joe comes at him Kevin opens up his body so he can check his left shoulder to get a good look at Steve’s movement. Timing the tackle is everything and as he sees Joe work another step over, Kevin intuitively knows Joe will try and go around him. As Joe side-foots the ball to the right Kevin sticks his foot out and knocks the ball away from Joe, away from danger. Kevin is learning the art of defense. He is learning how to shape his body, how to see others, and how to time a tackle. Every day at the park Kevin’s brain was overwhelmed by a whirlwind of information. When Steve and Joe invited their older mates to come play, Kevin was the youngest and smallest and had to think quickly to deal with the bigger players’ physicality. He learnt to lose his marker by using his weight and body shape – he pretended to go one way then quickly shifted in another direction. He became adept at finding space by looking up more than everyone else. He learnt to go around defenders not by pace but by throwing a shape. Body angle left, move right. And he learnt to score goals, lots of them, by using his movement to get in front of defenders and by taking first time shots without care of outcome. Kevin’s education as a football player was the exact mode of practice that Anders Ericsson calls deliberate practice. Deliberate practice isn’t easy and it begins in the brain. It’s not a soccer player doing an hour of training, doing a bit of five-a-side and having fun with mates. It’s mentally and physically taxing. It is a kind of focused, repetitive practice in which you are always monitoring your performance, correcting, experimenting, listening to immediate and constant feedback, and always pushing beyond what you have already achieved. Let’s examine the attributes of deliberate practice in relation to the way Kevin developed his football. Repetition: Kevin practiced a lot! Deliberate practice centers on repetition. Champions become champions because they practice over and over again, no matter what the weather, no matter what the conditions. Don’t expect to become any good at anything without doing it a lot! Some of the greatest soccer players of all time come from a background of poverty. Pele grew up in Sao Paulo in Brazil, so poor that he couldn’t afford a soccer ball and was often forced to play with a sock tied to a piece of string or with a grapefruit. Maradona too was born into poverty and lived his first years in Villa Fiorito, a shantytown on the southern outskirts of Buenos Aires in Argentina. Both of these legends of the game practiced and practiced. They did so in dirt and mud. They did so despite not having the money for flash boots and state of the art soccer balls. Just as the greatest swimmers swim hundreds of lengths every day and the greatest golfers hit thousands of golf balls every week – a footballer must dedicate himself to play and practice. Kevin Gallen describes Acton Park as his home from home. In school holidays he woke at dawn, put on his tracksuit and walked the couple of hundred meters to the park. He took hundreds of thousands of touches on the ball, took thousands of shots and spent endless hours passing and tackling. He perfected his spot kicks over time by taking penalty after penalty against his older brothers who acted as keeper. At first they saved most of his shots and they made fun of his weak strikes. But over time the taunting grew quieter as the power in his legs and in his kicks grew greater and greater. He would score more times than they could even get a touch on the ball. Like most youngsters Kevin and his brothers had a love for football you can almost touch. They had a compulsion to play just as much as a will to win. It was only darkness that ceased the repetitive practice and forced them inside. Kevin was constantly challenged by those he played with every day. As a small 10 year old he played with his equally football obsessed brothers: Joe, who is now assistant manager at Millwall FC and 4 years older than Kevin, and Stephen, who is now Head of Academy at QPR, and 2 years older. Because he was frequently playing with players who were bigger, stronger and quicker than him Kevin was always stretched as he competed. At a minimum he had to keep up with them, but his passion and approach was to find ways to beat them. This self-induced pressure forced him to focus his mind with a level of intensity that would be unusual for a teenage soccer player. It was this degree of focus that played a huge part in his rapid progress. With a will to beat his brothers at football Kevin was required to build his skill levels quickly. This meant he couldn’t allow himself to slouch or take a break for a few seconds. To his younger mind his brothers moved with speed and agility. He had no time to think about the past. Mistakes had to dissolve into the background so he could fix his focus on the present moment. His will to improve extended to post training analysis. In his bedroom after dinner he reviewed and analyzed how well he did against them and asked himself how he could do even better the next day. He didn’t write anything down but he kept a mental note of the components he had to work on. Many hours of focused, goal directed training is your launch pad for improvement. Every minute of practice offers a learning experience. Striving to be a little better each day provides mental fuel on your journey to discovering how good you can be. Kevin was always getting barracked by his brothers. They were always mickey taking when shots were struck poorly or passes went seriously astray. But underneath the ‘banter’ (as we call it in England) there were always instructional comments for Kevin. “You shot when you should have passed there” or “You didn’t get your head up… I was calling for it” were the types of feedback Kevin grew accustomed to. Kevin came away from the park every day with his head buzzing with ideas. Not only did he take time to self-analyze but he pondered the comments his brothers had made during the day’s practice. If they had shouted at him for shooting he asked himself why he had shot and why the option to pass was better. If they’d moaned at him for missing the target he thought a little about how he could get better at hitting the target. If they’d barked at him for losing control of the ball he imagined ways to improve his first touch. Kevin reflected on his day of practice not as if it was just a game (although he had a lot of fun playing) but as if it was his obsession to improve – to get slightly closer to the performances of his older brothers. Deliberate practice involves feedback – verbally from others, visually from watching yourself play, or kinesthetically (from your bodily feelings) from your own mind. Most of the time you need feedback from an outside source, from a coach or mentor. Make sure this feedback is as specific as possible and is solution focused. You need a coach to tell you about your game, the things you can control. Ask your coach what he felt you did well, then ask him to tell you what he feels needs to go better. “You need to win more headers” is not specific enough. “You need to time your jumps better to win more headers” is more precise feedback and gives you something tangible to work on. Allow me to give you a few more examples of good and bad feedback. Of course you can’t control the initial feedback from your coach but you can ask him to elaborate. You can ask him to tell you exactly how he wants you to improve the specific area of the game he gives you feedback on. Remember, a great coach is only as good as his students are at learning. So take ownership of your feedback and communicate with your coach. Keep asking him what specifically you have to do to improve your game. How often do you practice and train? 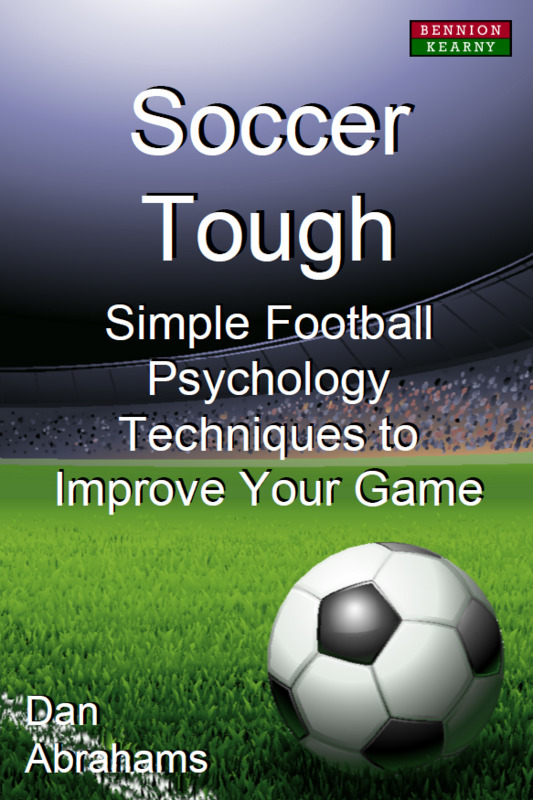 Very few people reading this book are professional soccer players. Very few people can (or want) to make a living from the game. But if you are a recreational player who enjoys playing on a weekend for your local team or playing five-a-side with work colleagues then please do take a little more time to practice your game. You’ll be amazed how much you can improve just by turning up to the pitch 30 minutes earlier than normal to do a little more practice. Take a few shots, put some cones out and dribble around them. Invite a friend so he can go in goal or so he can try to tackle you in a one-versus-one. If you train twice a week then an extra hour over those 2 sessions turns into 4 hours over the course of a month. So you will put in another 40-50 hours a year for just an extra small effort 2 days a week. Improvement starts in the brain so it’s important you make your practice and training as mentally demanding as possible. It’s easiest to do this in your extra practice. Make your shooting practice tougher by making the goal smaller. Place 2 bibs inside the goal, a couple of meters apart, and try to hit between the bibs from different angles. Maybe get a team mate to put you under pressure by closing you down quickly. If you are dribbling around cones then put those cones at ever decreasing distances apart so your ball control has to get better and better. There are a whole set of drills you can do on your own or with a partner. The main message from the concept of deliberate practice is that soccer drills have to make you stretch your mind. They must be mentally demanding and physically challenging. They must make you think and they must pinpoint your focus. In football most of your sessions are set by the coach so it is up to you how you make the sessions mentally tougher for yourself. You could try to complete a passing drill with your head up more – checking your shoulders before the ball arrives at your feet. With drills that require a good first touch you could stretch yourself by trying to constantly improve your ability to deaden the speed of the ball. Similarly, if a drill involves running then you could strive to execute the drill while working on your running technique. Deliberate practice demands that you don’t get lazy as you train with your team. This is something I see time and again with soccer players. They complete drills with poor body language, in a ‘switched off’ manner. Stretch yourself. Strive to complete every drill to the best of your ability. Be the best at doing exercises, practices and drills on the team. Execute them with a goal in mind and with complete confidence. When you play small sided games or practice matches deliver a performance outside of your comfort zone. Play with freedom and focus. Try to do things you haven’t done before. Experiment! If the coach asks you to rein things in then do so but until that time look to broaden your set of skills by attempting new movements, new techniques and new plays. In this way you set a path to becoming an expert performer. You’ll start to see things on the pitch differently and see things that you hadn’t seen before. And I mean both visually and mentally. Expert performers in any walk of life have a better and faster understanding of what they see. An expert driver will see a hazardous situation before a novice driver. An expert tennis player will see the way his opponent is shaping up to hit the ball. He can predict where the ball will come back to him and with what type of spin. Great footballers have this kind of ‘better and faster’ understanding of the game. The game is slower to them. They have a feel for the game that enables them to make decisions and constant adjustments before everyone else. This starts with deliberate practice. This starts by practicing more and then by making sure you are taxing your brain as you train – stretching yourself. As I mentioned in the introduction to this book the beauty of my profession is that I can help players improve without them having to break sweat. They can work on their mindset in the quiet solitude of their own home. The great thing about deliberate practice is that it encompasses not only the times you are training but it also involves the notion of studying the game. If you start the process of becoming a student of the game then every minute you spend in learning mode counts toward your 10,000 hours of practice. Do you understand the formation your coach likes you to play in? Are you aware of the role and responsibilities of your team mates? You may not be able to play like Xavi Hernandes but do you know as much about playing as a midfielder as he does? You may not score any goals for AC Milan but do you know your striker role as well as Zlatan Ibrahimovic? If not, why not? It’s only knowledge, and yet knowledge is a powerful forerunner to skill. When you know more you can do more. Do you watch much soccer? You probably do, but let me re-phrase this question slightly. Do you study much soccer? When you next settle down to watch one of the world’s leading games such as Barcelona versus Real Madrid, Inter Milan versus AC Milan, or Manchester United versus Chelsea I invite you to study the game as you watch. This means taking your eye away from the ball and focusing on the players. What are they seeing that helps them make the decisions they make? I have asked you several times to imagine yourself as a world beater. It is especially important you exercise your imagination when you watch soccer. When does the defender I’m watching close down his opposition? What body shape do they keep to be able to see man and ball? When do box-to-box midfielders surge forward and when do they track back? What movement helps the striker I’m watching lose a defender? How is he getting free from his marker inside the box? Questions, question, questions. Answer these questions in your mind and imagine yourself on the pitch in the game you are watching making the same plays as the world beaters you are learning from. This works, and works powerfully. How? As a result of a quirk of the brain. Everyone in the stadium starts to hush. I don’t know about you but when I watch top level sport I experience a little of what the competitors do. When I watch the Olympic final of the 100 meters I can feel my body shake a little and I can sense my heart rate jump slightly. I don’t have the same nerves as those who are running, but I do get a few nervous sensations running up and down my body. Emotions and actions are easy to catch. When we see someone cry or laugh, display anger or show pain we can share a piece of what they experience. Equally when we watch a powerful movie filled with emotion our own feelings swell and when we listen to great music by a band – it’s as if we can experience a piece of what they are going through. The secret behind this lies in our brain. Over twenty years ago a group of Italian researchers hooked wires up to the brains of monkeys. They found that the brains responded in the same way whether they were picking up some food or simply watching other monkeys pick up food. The same region of the brain would light up. There have been identical results in humans. If I was to watch you switch on the TV, the areas of my brain that would respond would be the same areas that engage if I was turning on the TV myself. So what has essentially been discovered is that the brain has mirrors. This means we do a lot of our learning by watching other people. This includes sport as well. For example, a scientist called Daniel Glaser asked some ballet dancers to watch other ballet dancers while he hooked up some wires to their brains. He found that the dancers had substantial activity in the part of the brain that controlled dancing when watching other ballet dancers. It’s clear I can watch you do something, such as chipping a football, remember it, then use the same skill later. That sounds obvious but how many of you take time to model players who are better than you or who are better than you in a certain area of the game such as tackling or passing? The process of learning from others is a genuine part of your 10,000 hours of training. Simply by watching someone play you are feeding your mind and developing your skill. Choose a player to model who plays in the same position as you. As a real world example, Carlton Cole chose to take time watching Didier Drogba and John Carew play. He enjoyed taking DVDs home from the West Ham training ground to watch them play from the comfort of his sofa. Choose a player whose attributes you’d like to build into your game. If you’re a central defender you might like to watch the competitiveness and strength of Carlos Puyol. A full back might clip footage of Paulo Maldini or Ashley Cole. Perhaps as a midfielder you might get inspired by watching old recordings of Zinedine Zidane. Whilst you might not be able to replicate his skills, just by imagining executing his movements you will get a boost of confidence and motivation. Similarly as a striker you might record the runs of Shevchenko, watch the goals of Ruud Van Nistelrooy, or bring out old highlights of Gary Lineker’s positioning. The point is that you choose someone who you believe has the characteristics that your game can build on. When you watch your models – try to see the world through their eyes. Mentally place yourself in the body of your chosen player. Feel what he feels. Think what he is thinking. Look where he is looking. Use the whole of your body. If you are modeling the powerful clearance headers of John Terry feel yourself push off the ground, leap high into the air and launch your head onto the ball. Allow yourself to see the ball soar into the sky and bounce down on the half way line. Add an opponent to make your images as authentic as possible. Feel your opponent jump against you – feel him straining to get his head on the ball. But always win the challenge. Add a sense of character to your images. If it’s John Terry then inject your images with reality by sensing a feeling of dominance. If you are watching the German midfielder Mesut Ozil then add a sense of liveliness and confidence. If it’s the French striker Karim Benzema you are modeling then enjoy the feeling of strength that he brings to his game. Putting yourself into the boots of American striker Landon Donovan? Then enjoy a feeling of freedom, dynamism and pace. Of course there is a little guesswork to this process but I really want you to get into the action when you watch your model. Don’t be frightened to act as you watch and picture. Stand up and pretend to trap the ball just as your model does. Jump up and win a header just like your model. I want you to literally do it. The quantity and quality of your training is a big determinant of your trajectory as a footballer. However, as we shall discuss in the next chapter it is important to add a sense of patience, calm and relaxation into your training and your game. Driving toward perfection is dangerous – therein lies fear and anger.